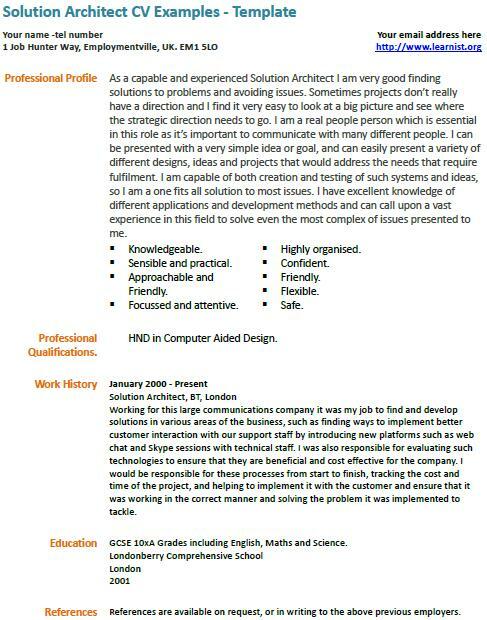 Solution Architect CV Examples – Template. Amend this cv examples as suitable and write your own CV in minutes. This sample is fully editable and free. As a capable and experienced Solution Architect I am very good finding solutions to problems and avoiding issues. Sometimes projects don’t really have a direction and I find it very easy to look at a big picture and see where the strategic direction needs to go. I am a real people person which is essential in this role as it’s important to communicate with many different people. I can be presented with a very simple idea or goal, and can easily present a variety of different designs, ideas and projects that would address the needs that require fulfilment. I am capable of both creation and testing of such systems and ideas, so I am a one fits all solution to most issues. I have excellent knowledge of different applications and development methods and can call upon a vast experience in this field to solve even the most complex of issues presented to me. HND in Computer Aided Design. Working for this large communications company it was my job to find and develop solutions in various areas of the business, such as finding ways to implement better customer interaction with our support staff by introducing new platforms such as web chat and Skype sessions with technical staff. I was also responsible for evaluating such technologies to ensure that they are beneficial and cost effective for the company. I would be responsible for these processes from start to finish, tracking the cost and time of the project, and helping to implement it with the customer and ensure that it was working in the correct manner and solving the problem it was implemented to tackle.